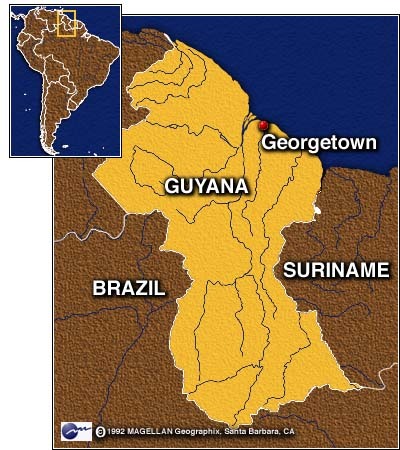 GEORGETOWN, Guyana(CNN) -- Cheddi Jagan, who became Guyana's president years after his first bids for power were blocked by Britain and the United States, which opposed his Marxist beliefs, died Thursday in a Washington hospital. He was 78. The government said Jagan died at 12:23 a.m. EST (0523 GMT) at Walter Reed Army Medical Center, where he had been hospitalized February 16 after suffering a heart attack a day earlier in his home in the Guyanese capital of Georgetown. He was flown to Washington aboard a U.S. military aircraft. Jagan underwent an angioplasty procedure at Walter Reed to clear a blocked artery, but his condition had worsened in recent days. His wife, Janet, and their two children, Cheddi Jr. and Nadira, were at his bedside when he died. Prime Minister Samuel Hinds, who is next in line to succeed Jagan, declared a six-day national mourning period. In a radio broadcast, he called Jagan "the greatest son and protector that has ever walked this land." The son of indentured Indian immigrants and a U.S.-trained dentist, Jagan helped lead Guyana to independence from British colonial rule in 1966. As head of the People's Progressive Party, supported by Guyanese of Indian descent, he was elected president in 1992, ending 28 consecutive years of rule by the People's National Congress party. Jagan first won in colonially administered elections in 1953, but Britain suspended the constitution under pressure from the United States, which feared a Communist beachhead in South America. He won again in 1957 and 1961 elections, but his power was checked by an alliance of foes backed by the CIA. Jagan founded the People's Progressive Party with his American-born wife, Janet, who served as a home affairs minister before independence. The party became Guyana's dominant political force in the 1950s. East Indians comprise 52 percent of the South American country's 730,000 population. Rumors that Jagan was forging ties with the Soviet Union caused the British government to send troops to then-British Guiana in a 1953 intervention, forcing Jagan to resign as prime minister after only 133 days in office. Britain suspended British Guiana's constitution, and an interim government was chosen. Jagan's movements were restricted to Georgetown between April 1954 and 1957. For violating that order, he was jailed for five months in 1954. In 1964, with independence nearly assured and Jagan looking toward election as Guyana's first post-independence leader, a massive labor strike erupted in Georgetown. More than 150 people died and thousands fled to Britain and the United States in the ensuing riots. Jagan, who had cultivated trade ties with Cuba and the Soviet Union, accused the United States of secretly sponsoring the strikes, which lasted 80 days and caused Britain to renege on it promise of independence. Forbes Burnham, the U.S.-backed candidate and leader of the People's National Congress, defeated Jagan in the 1964 elections. Burnham's party was supported by the Afro-Guyanese minority, which comprises 30 percent of the population but controls Georgetown. When independence finally came in 1966, Jagan watched from the sidelines. "In my country, a microcosm of today's world, successive U.S. and U.K. governments have achieved their purpose by force, fraud and rigged elections," Jagan wrote in a 1966 autobiography, "The West on Trial." "Britain has handled us and the question of our independence not in our interest, but in hers. ... (We) have been part of a barter deal with the U.S.A.; part of the price paid for the U.S. government's defense of Empire interests." Despite widespread accusations of corruption, Burnham's party governed until 1992, when Jagan beat out Desmond Hoyte in the country's first internationally monitored elections. This time, Jagan and his party had the support of the United States, which had seen millions of dollars in foreign aid squandered during People's National Congress rule. Jagan was born March 22, 1918, in Guyana's eastern district of Berbice. His father, a poor stone cutter, managed to send Jagan to the elite Queen's College High School in Georgetown. He later went on to study at the Howard Dental School in Washington, D.C., and Chicago's Northwestern University before returning home in the early 1940s. Disgusted by conditions back home in then British Guiana, the young dentist became involved in the burgeoning labor movement and won a seat in the colonial legislature in 1947.